Please use our canon camera battery finder to check which battery your camera needs. Please use our canon camcorder battery finder to check which battery your camcorder needs. This is the high capacity battery that Canon Digital Rebel XT and XTi (EOS 350D and EOS 400D) use. Regular Canon Digital Rebel (EOS 300D) uses BP-511 which we also have. Please make sure which "Digital Rebel" - if that's the camera you have. 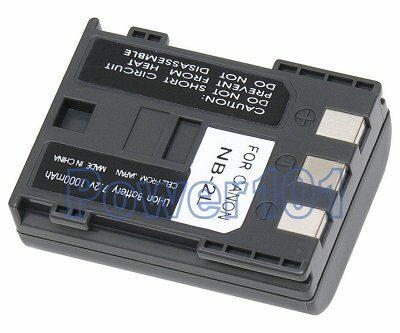 This battery is also compatible with many other cameras such as with all mid-size Canon "S" cameras S30 S40 S45 S50 S60 S70 S80. It is also compatible with many small size camcorders Elura 40 50 60 65 70 80 85 90, Optura 30 40 50 60, ZR100 ZR200 ZR300 ZR400 ZR500 ZR600 ZR700 and few others. Please check your camera/camcorder with our battery finder. 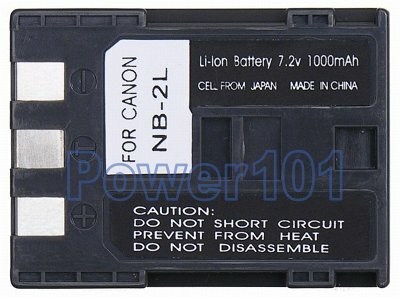 This battery can be charged with any charger compatible with Canon NB-2L or NB-2LH batteries. Such as the charger that comes with your camera. Or if you have a camcorder - you can charge this battery inside the camcorder just as the original one.